Well, it's official. I'm now the proud owner of BucketSoft, LLC. It's a one-man software company I started this year. I must say it's pretty exciting. I got rid of all the ASP code on my site, and so it should be more stable now. =) What a relief! I feel bad that I haven't been able to keep my promises concerning this site. I spend so much time with computers at work, that I don't feel like spending hours at home working on OpenGL stuff very often. However, I do have a couple of projects that I work on every once and awhile. The project with the highest priority is a terrain rendering utility for Terra3D. I am making a simple utility that will allow you to import a heightmap in bmp format, and render a lightmap accordingly. The lightmap is rendered by raycasting from a single light source (the sun). I have had some issues with calibrating the heightmap properly, but it is almost ready. Basically, what the utility will allow you to do is import artificial or even natural topography from anywhere in the world. I have a topography map of Death Valley in California that I might use. 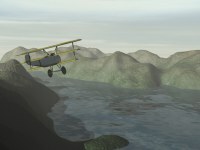 Once it is imported and the lightmap is rendered, you could then fly through a simulated Death Valley in Terra3D. The other project is my First Person Shooter program. It runs very well right now, but it has a very weird bug involving the mouse. So I need to convert the mouse and keyboard input to Direct Input. And I think that will solve the problem. I just uploaded a site that I have been working on ever since I started at Combus Technology. It's at ChurchMusicNow.com. It's bigger than any other site I have worked on. We used ASP and Microsoft SQL to do our shopping cart, registration process, and many other things. Anyway... beta testing is suppose to start next Monday. OK... Another Terra3D update. This one includes source code! I finally gave in to the emails asking me to make Terra3D open source. So, it's now free to distribute under the GPL license. Sorry for the delay. I have been very busy with work and school lately. But I realized today that my Terra3D program is pretty much ready to be released. So, I packed it up and it is now available for download. Please note that I didn't pay much attention to the physics with the jet. You will probably discover quickly that there is no collision detection, and the maneuverability of the jet is not true-to-life. I mostly paid attention to visual quality and speed. And it runs at about 40 FPS with normal detail on an Athlon 500MHz with Voodoo3 2000 AGP. The Gravity / Momentum Tutorial part 3 has been posted! I couldn't stop! Heheh.. I just had to make some improvements. The tutorial started to get out of hand. And I was about to just replace the source code for part 2 with this one, but decided that I added too much to do that. So now the Gravity / Momentum tutorial involves 3 individual mini-tutorials. That is the way I learned a lot of things in my computer science class. We had many example programs, and as we went along, each program was slightly different from the previous one. I hope that method works well for you too. The Gravity / Momentum Tutorial part 2 has been posted! This tutorial teaches you how to make a particle system in which every particle is attracted to one another by gravity. It is the same effect I used in my Nebula screensaver.